I joined TDC in 2005 because I was looking to use my marketing and sales skills to build a business in the Home Improvement marketplace. TDC is a perfect fit for me as it allows me to do the work I love combined with running my own service business helping homeowners repair and maintain their property. As a TDC representative I focus on three areas; Deck restoration, Painting, and Deck & porch construction. The majority of our deck work is very high end focused on the installation of Brazillian hardwoods and composite decks. I graduated from U. Mass Amherst in 1986 with a communications and psychology degree. I’ve worked in marketing and sales for the last 31 years, the last 12 as a Total Deck Care owner/operator. I have been married for the last 26 years to the “Fabulous Lynn”, who also helps me run my business and without whom I could not do this. I have 2 children, Linsey (24) and Joshua (20). Lindsey is a working professional in the mental health field and is attending Graduate School and Joshua is a College Athlete currently attending Southern NH University in Manchester NH. We enjoy spending time together skiing, going to the beach and sporting events. We have 2 dogs, Crosby & Brody, the newest member of our family. Certified and trained as wood restoration specialists, Total Deck Care uses a high end, professional product for preserving and protecting wood. 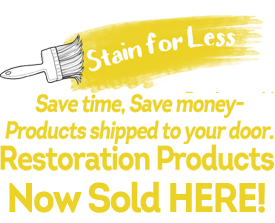 This wood restoration product is unlike any other on the market. We believe that its formula offers the best protection for wood, and unlike other companies, we guarantee it. Of course, Total Deck Care is a fully insured company and has workmans' compensation on all employees. for a no obligation quote!